Silvestr Shchedrin, the greatest Russian landscape-painter of the early nineteenth century, was the most striking exponent of the realist aspirations of the time. Shchedrin’s first successful art lessons in the family were soon backed up by training at the Academy. From 1800 his teachers were M. M. Ivanov, F. Ya. Alexeyev, whose main interest at that time was in painting views of St. Petersburg, and the architect Thomas de Thomon, who taught him the laws of perspective. In 1811 Shchedrin graduated with a gold medal. His graduation piece was the landscape View from PetrovskyIsland in St. Petersburg, which conformed totally to the classical spirit. However, the young artist’s interest in depicting concrete, rather than ‘invented’, views soon asserted itself in his first large-scale works: View of Tuchkov Bridge From Petrovsky Island (1815, TRETYAKOV GALLERY, MOSCOW) and View of the Stock Exchange From the Bank of the Neva (1817, RUSSIAN MUSEUM, SAINT PETERSBURG). In 1818 Shchedrin was among the first four pensioners to be sent to Italy. His travel notes and his letters home, written with gentle humour, reveal the artist’s lively mind and powers of observation. Having settled in Rome, Shchedrin set about painting views of the city. He was attracted by the Colosseum, his approach to which was far from classic. ‘The Colosseum,’ Shchedrin wrote, ‘ordered me to paint its portrait.’ Contemporaries noted that in this ‘portrait of a building’ the real-life ‘model’, with its powerful architectural forms and distinctive stonework, was excellently conveyed. In the picture New Rome. Holy Angel Castle (1825, TRETYAKOV GALLERY, MOSCOW) the artist reveals the beauty in simple and ordinary things. The grand structures of the Holy Angel Castle and St. Peter’s Cathedral become part of the general city scene. Shchedrin tried to convey the play of light on the rocks and walls, on the greenery and the boats—light which united all these objects, sometimes making them shine or sparkle, sometimes concealing or emphasising their contours. He softened the highlights on the water and made the shadows transparent and airy. The buildings give the impression of being wrapped in air. In this painting Shchedrin passed from heavy, dark-brown shades to light silvery-greys. ‘With great difficulty I have extricated myself from these dark shades,’ he wrote to the sculptor S. Galberg. In a small, iridescent landscape LakeAlbano in the Outskirts of Rome (1823-24, RUSSIAN MUSEUM, SAINT PETERSBURG), the water gleams with silver, while the verdure seems airy and suffused with pink sunlight. Light acts like a magician, transforming everything. This painting is one of Shchedrin’s masterpieces. The artist’s seascapes are particularly poetic. 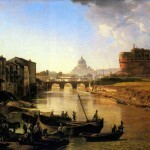 He was enraptured by Naples and its surroundings. On his first trip there from Rome, which lasted from June 1819 to the spring of 1821, Shchedrin lovingly described the colourful life on the seafronts, the merry-making and carnivals, and the scenery of southern Italy . . .
At this time Shchedrin made friends with Karl Bryullov and Konstantin Batyushkov—it was with the latter that he stayed while in Naples. Together with Orest Kiprensky he began work on a portrait of A. M. Golitsyn. Having ultimately settled in Naples in June 1825, Shchedrin undertook trips to Sorrento, Capri, Vigo and Amalfi. 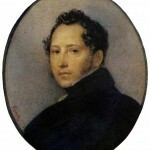 His landscapes and seascapes ranked among the finest plein air paintings anywhere at that time, especially the series which included On the Island of Capri (1826, TRETYAKOV GALLERY, MOSCOW), The Small Harbour at Sorrento (1826, TRETYAKOV GALLERY, MOSCOW) and The Large Harbour at Sorrento (1827, TRETYAKOV GALLERY, MOSCOW). Nature here accords with man, whose natural and contemplative life takes its course in the ‘happy moments of being’. The unusual composition of the seascapes (the closed line of the sea-shore) not only lends them an intimate, chamber-work quality, but also likens them to open loggias. Arbour Covered with Vines (1828, TRETYAKOV GALLERY, MOSCOW) and Grotto at Sorrento (1829, TRETYAKOV GALLERY, MOSCOW) rely on the contrasts between the shaded area and the sunlit open countryside. The midday sun penetrates the dense greenery of the olives and grapevines, picking out the people’s figures and patches of vegetation amid the shadow. 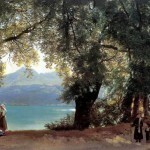 In his later period, Shchedrin moved away from chiaroscuro tonal painting in favour of heightened colour range, as is clearly illustrated by SmallHarbour in Sorrento. Evening (1826, TRETYAKOV GALLERY, MOSCOW) and Moonlit Night at Naples (1828, TRETYAKOV GALLERY, MOSCOW). 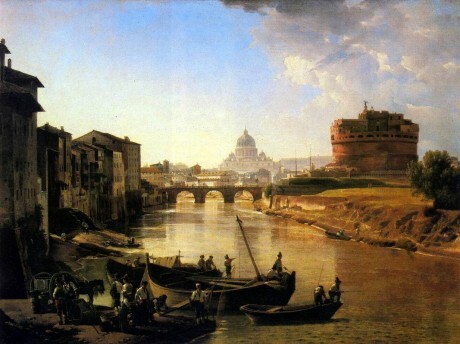 Shchedrin gained popularity in Italy and his landscapes sold well. Meanwhile the dates of his stay abroad had long since expired. He was put off by the thought of a future in the formal atmosphere of the St. Petersburg Academy of Arts. But he did not entirely abandon thoughts of returning home: ‘I am most displeased by your advice not to go to Russia,’ he wrote to S. Galberg. Despite a serious, progressing illness, the artist did not lose his joie de vivre and sense of humour. His last letters from Italy were full of hopes for a recovery and for a return home. But he never did return to his native country. In October 1830 he died, and a monument by S. Galberg was erected on his grave in Sorrento. Silvestr Shchedrin gave his own lyrical interpretation of the scenery of Italy—something that eluded many of his contemporary Ita lians. His landscapes contained that poetic affirmation of the beauty of simple things which was so characteristic of Russian portraiture and genre-painting of the first half of the nineteenth century.